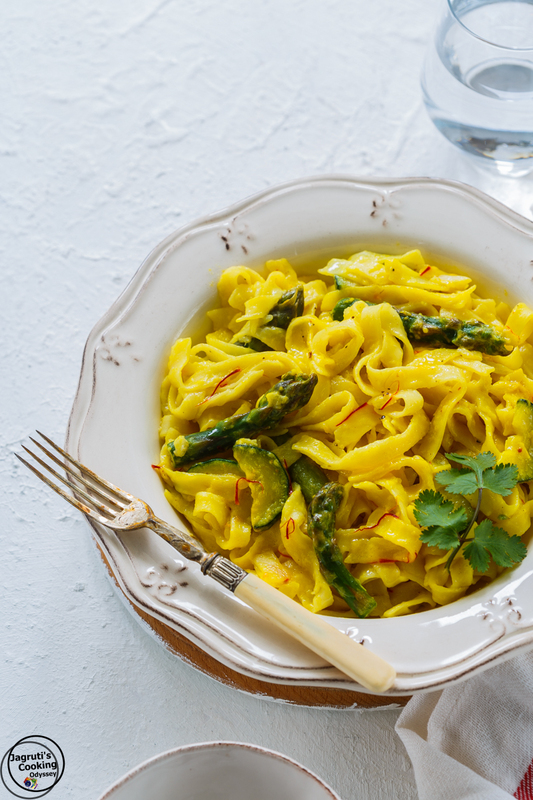 Vegan Saffron and British Asparagus Pasta, is literally gold served in a bowl, yes, this bowl of pasta seems expensive but let me assure you, it is totally worth it. This luxurious creamy pasta sauce will surpass any of your normal pasta cream sauces. 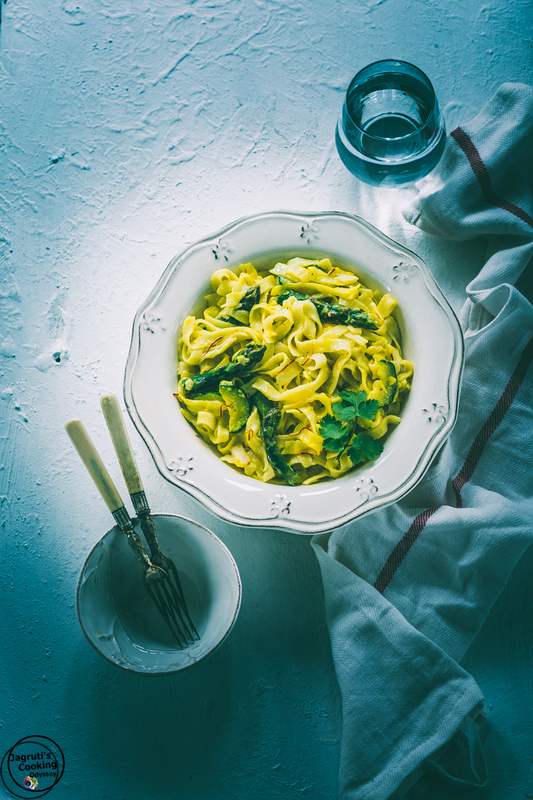 This easy but heavenly pasta comes together in less than 15 minutes on your table with minimal ingredients, This dish is perfect for a summer lunch, when you really don't want to work too hard at cooking, but have a craving for something attractive and satisfying. Indian women and their love affair with gold is known to the whole world, for Indians, gold is that ultimate love object. As much as we love gold, we love saffron and obviously take great pride in decking up with gold and cooking with saffron, the world's priciest spice. Well, let me tell you about me then, I love to cook with saffron but not so much keen on gold. For more Vegan recipe click here . In our recent visit to Zurich, we were invited to the Hiltl, world's oldest vegetarian restaurant. We tried for the first ever time saffron pasta, since then these awesome flavours were dancing in my head. The waiter who was looking after us at Hiltl, told me about all the ingredients they used in this recipe so I had a rough idea how to cook this pasta. 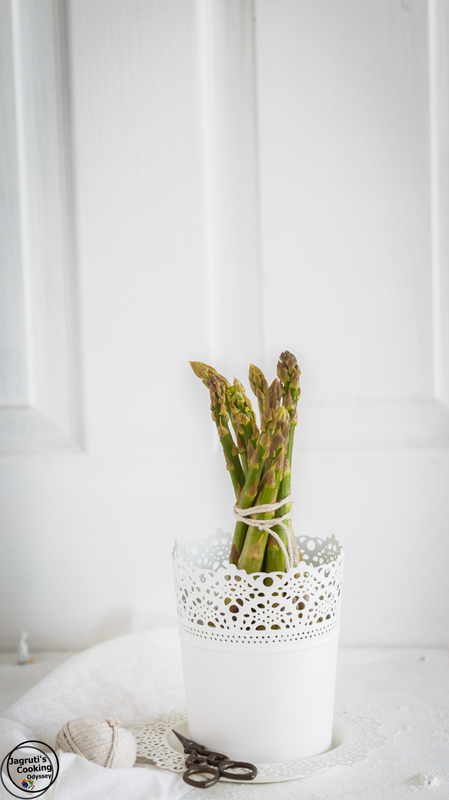 Now that British Asparagus is appearing plentiful on our markets and shops, it was time to pick up a bunch as they are here for only 8 week season. So this time it went in this pasta dish. Although in original recipe, Hiltl suggested double cream, but to keep dish little lighter I used coconut milk and skipped any kind of cheese, also butter was replaced with coconut oil, still, pasta was fabulous and the whole family enjoyed it immensely. This creamy and vibrant pasta can be served as a starter or a main meal . If you serve as a starter I recommend keeping the portions very small. Use dairy cream and butter if you like. Sprinkle cheese once pasta is done, vegan can use nutritional yeast. 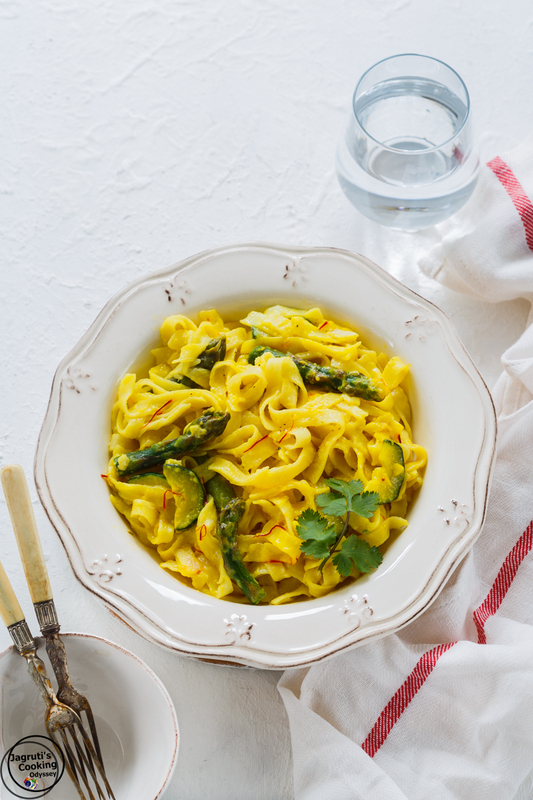 This Vegan Saffron and British Asparagus Pasta is prepared with luxurious and king of spice Saffron.The Saffron adds a lovely golden hue and a light aromatic flavour that compliments the coconut milk. And briefly cooked crunchy asparagus lends beautiful extra colour to this dish. Cook the dried pasta according to packet instructions.In a heavy bottom pan heat oil and fry garlic just for a few seconds.Add asparagus and chopped courgette and saute not more than 2 minutes.Add saffron and coconut milk, keep the heat on very low and stir the coconut milk until it gets little thicker.Now add drained pasta, salt, pepper and red chilli flakes.Stir very quickly and serve hot.Enjoy! 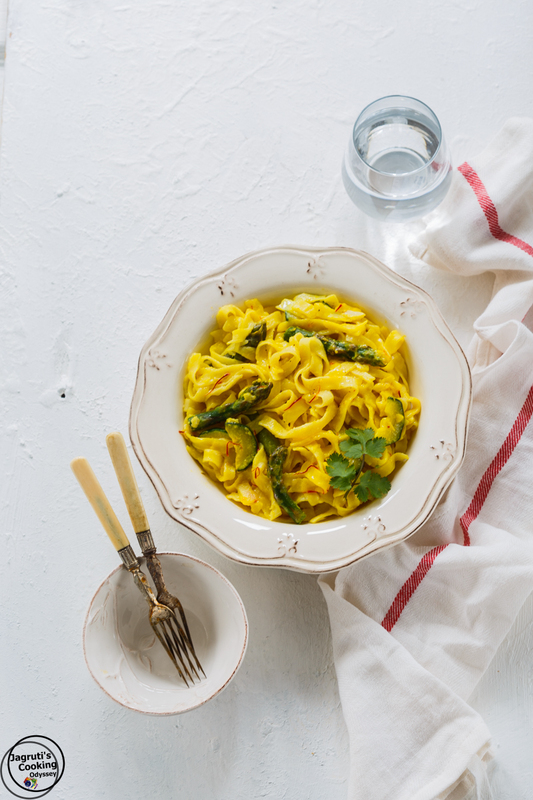 I love the way the saffron has given the pasta such a beautiful yellow colour! It looks like a lovely vegan meal and healthy too. This looks delicious! I don't use saffron very often - almost never actually - but this is an easy way to incorporate it. Yum! This sounds so tasty and special for a relatively simple meal! Makes me wish asparagus season were longer where I live - maybe I will swap green beans or similar! Wow! I love cooking with saffron -- but I've never used it with coconut before. Can you still taste the saffron? I'd think it might overpower the subtle taste. It looks beautiful! Saffron and coconut milk, two of my favourite ingredients - instant hit! What a gorgeous dish of pasta! The saffron makes it absolutely glow! Thanks for the inspiration! Those flavors sound wonderful, and those colors are amazing! I love Zurich! This sounds like a fabulous recipe especially with the saffron! Yum! 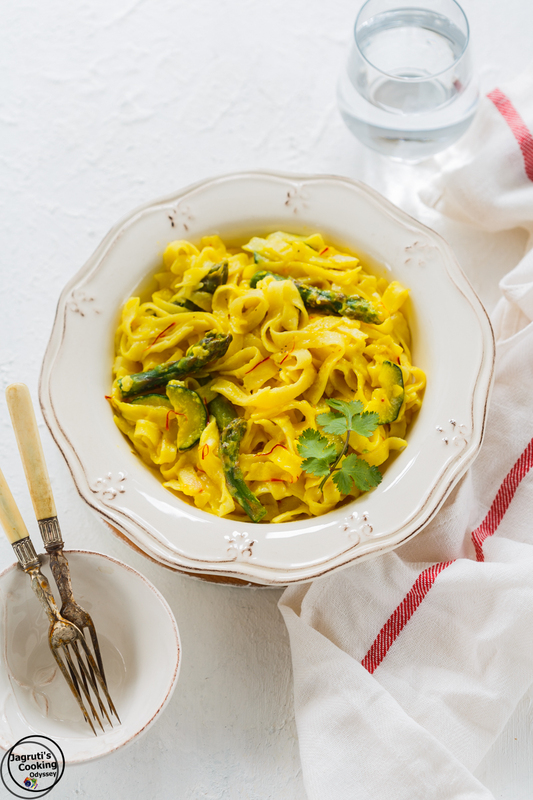 Love saffron and coconut milk in dishes, and love pasta. I'm not a big fan of asparagus, but your pictures make me want to try it anyway. Nice Photos!! That is a beautiful pasta dish. Then saffron really adds a lot of flavor too. Thank you! Love the color the saffron has lent to the pasta dish. Gorgeous photos Jagruti! That is such an exotic looking dish Jagruthi. Saffron is a great addition to pasta sauce -- never tried it before. Look at that beauty! Love the colours and the recipe! Never tried adding saffron in pasta, simply awesome and looks very colourful. Never tried using coconut milk for a pasta dish. Th plateful of pasta looks so inviting. Never tried saffron in pasta, this sounds and looks amazing. Wow, this is the first time I have heard of saffron in pasta. Sounds delicious the pictures are beautiful. What a flavourful fusion.. never heard of saffron flavoured pasta before.